I've been meaning to post this for ages. Doryman took it at the Wooden Boat Festival in Port Townsend, a lovely inlet off the Pacific Ocean in Washington State. He doesn't say what it is, but it looks like one of Platt Monfort's Airolite boats, perhaps the Classic 12. 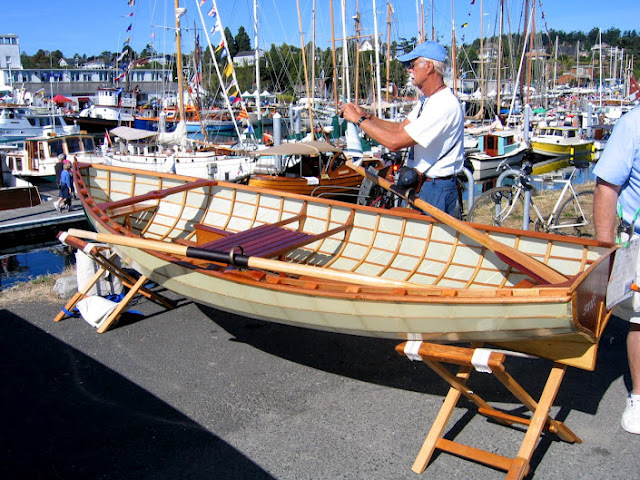 Airolite skin-on-frame boats are made by creating a light frame and heat-shrinking a fabric such as Dacron onto it. Very light and fast but perhaps not as rip-resistant as one would wish.